ix, 99 p. : ill. ; 28 cm. Boonterm Tiravattnaprasert ... et al.. The authors wish to express their appreciation for the constructive comments and suggestions of Dr. Cristoph E. Mann and Dr. Derek Byerlee of CIMMYT. Valuable assistance in field data collection and interpretation was provided by Mr. Supote Ruanwong; Mr. Veera Suriwong and staff of the Office of Agricultural Extension in Fang District, Chiang Mai Province; Mr. Sumphon Mongkon and staff of the Office of Agricultural Extension in Pua District, Nan Province; Mr. Niwat Papopbun and staff of the Office of Agricultural Extension in Pai District, Mae Hong Son Province; Mr. Songsak Supamanee and staff of the Office of Agricultural Extension in Mae Sai District, Chiang Rai Province; and Miss Arlai Massjaroon, staff of the Northern Region, Office of Agricultural Extension. In addition, Dr. Phattakun Chandhanamutta, Mr. Tasana Larpruey, Department of Agricultural Extension and Mr. Vichien Lertphokanont, UFM Food Center Co., Ltd, provided invaluable information on wheat production, marketing and policies. Numerous friends and colleagues in the Office of Agricultural Economics, Ministry of Agriculture and Cooperatives, provided constructive comments. Finally, we wish to express our sincere appreciation to Dr. Boonjit Titapiwatanakun, for his advice and counsel; to Mr. Somporn Isvilanonda for his helpful comments; and to Miss Suda Sangthongsakullert, for her hard work in data collection and analysis. Authors are responsible for any remaining errors. Appendix Table 1: Private budget: Rainfed areas, till and row seed. Appendix Table 4: Private budget: Irrigated areas, till and row seed. Appendix Table 5: Private budget: Irrigated areas, direct drilling. The objective of this study is t) examine the prospects for domestic wheat production in Thailand. The study examines trends in wheat production, consumption, utilization, trade and prices, and analyzes the current state of production technology and marketing. Private and social costs and returns for domestic wheat production are then examined. Results of this paper should be used with caution, however, as wheat production techno logy and marketing arrangements continue to evolve. Wheat in Northern Thailand Is grown under both rainfed and irrigated conditions. In some rainfed upland areas, -wheat follows wet season maize. In these areas, wheat is planted in mid-October and relies on late rains and residual moisture for growth. In some lowland rice areas, wheat follows the main rice crop. Wheat production in this environment is most suitable where dry season water is relatively scarce, i.e., where the efficiency with which viheat can use scarce moisture gives it a competitive edge. Over the last several years, centers of wheat production have been developed in seven districts in six of the eight pr,)vinces located in Northern Thailand. Wheat area has increased to almost 1000 ha, from a low of less than 200 ha in 1980. Wheat production in 1990 reached 361 t. Clearly, wheat is not at present an important component of the Thai agricultural e conomy, but there is considerable opportunity for expansion. Imports of wheat and wheat products exceeded 350,000 t in 1990, with imports projected to increase to over 600,00(, t by the year 2000. Most of this wheat is used for bread, instant noodles, wet noodles and Chinese pastries, and biscuits. A surprisingly large percentage, however, is u,,;ed for animal (especially, prawn) feed. The structure of the wheat processing industry is, not surprisingly, organized to facilitate the processing of imported wheat. N onetheless, flour mills have helped foster domestic wheat production by offering to purchase it on favorable terms. International market prices for wheat, adjusted for inflation, have shown a declining trend over the past 15 year.;. Real wholesale flour prices in Bangkok have also declined over this period, althoLgh there is some reason to believe that increased processing margins have been partially masked by lower taxes on wheat imports. In 1990, after-tax prices for imported wheat grain were around B/6.2 per kg (US$ 161/t), compared to CIF prices of B/4.6 per kg (US$ 120/t). Marketing of domestic wheat was found to be surprisingly efficient., given the small size of the market. Marketing margins were found to be around B/ 1.09 per kg, mostly accounted for by transportation costs from producing locations i 1 Northern Thailand to Bangkok flour mills. - a social budget (where all inputs and products are valued at their opportunity costs -- particularly wheat grain, which is valued at border price equivalents). - wheat production is concentrated where it does not compete with soybeans or other winter crops for land and water resources. Demand for wheat products is growing quickly in many parts of the world, especially where urbanization and economic growth are proceeding rapidly. These include a number of tropical and subtropical countries such as Thailand, where wheat has little history of successful commercial cultivation on a large scale. As demand increases in these countries and imports soar, many agricultural researchers, policy makers, and private-sector investors find themselves wondering if locally grown wheat might not prove to be a competitive substitute for imports. Thailand has been actively promoting wheat production in the cooler Northern Region since 1987. In the past several years, wheat area has risen to nearly 1,000 ha. Wheat production is now, however, at a watershed. Recent gains in wheat area are the result of a prograrn implemented by the Ministry of Agriculture and Cooperatives, whereby farmers receive free wheat seed and fertilizer. However, there is as yet little evidence of independent and dynamic expansion of planted area outside of this program. Technology: The relative profitability of wheat depends on production technologies available to (and used by) farmers. As a non-traditional crop, however, wheat production technologies are still being developed. Farmers experimenting with wheat cultivation have had little time to assess alternative production techniques and incorporate them into their farming systems. Precise estimates of profitability may be premature as a consequence. Markets: Input supply and grain marketing for wheat is relatively risky and expensive due to a low level of mar -cet development. Traders are less likely to be aware of profitable opportunities for arbitrage between farmers and flour mills (assuming these opportunities exist). Existing marketing links are heavily specialized towards the processing of imported wheat. Policy and Incentives: Prior ty given by policymakers to food security or food self-sufficiency may not extend to n )n-traditional food crops like wheat. Some policies hinder local wheat production, while other policies promote it. After cutting through the effects of policy, it mus: be ascertained whether wheat production is a wise use of domestic resources, both in terms of efficiency and equity. Many areas of Northern Thailand are left uncropped during the cool season because of lack of moisture. Given wheat's known adaptation to conditions of moisture stress (especially compared to lternative winter season crops, e.g., garlic, tobacco or soybean) it would seem likely that the introduction of wheat into farming systems might offer an opportunity to make use of idle farm resources. Moreover, wheat typically has a relatively low cash input requirement, and uses little labor. Figure 1. Wheat Production Areas in Northern Thailand, 1990-199 1.
less than 1% of the country's wheat requirements. Early efforts to foster wheat F roduction in Northern Thailand date from 1962, when the Ministry of Interior initiated a Production Support Program for this crop. Under this program wheat area reached a peak of about 5,700 rail (912 ha) in the late 1960's. At that time, support for the program declined and area gradually declined to less than 1,000 rai (around 60 ha). At the beginning of the 1980's, there was a renewed interest in wheat research within the Department of Agriculture (DOA). Similarly, the Department of Agricultural Extension (DOAE) has revived efforts to promote the local production of wheat. In 1983, DOAE began a series of multi-location trials. Expansion of wheat area was endorsed as a goal in the Sixth National Economic and Social Development Plan (1986-1991). In 1987, DOAE initiated a major crop promotion campaign, featuring farmer training, and free provision of wheat seed and fertilizer, in eight provinces in Northern Thailand. from the DOAE promotional activiti s, wheat has enjoyed favorable policy treatment (e.g., import tariffs, price policies, etc.). Why hasn't wheat area expanded more rapidly? Will farmers continue to grow wt eat when current subsidies on seed and fertilizer are ended? 1. 1 ha = 6.25 rai. technology advanced to the stage where this crop can compete effectively with alternatives? Or are further improvements in input and product marketing needed before domestic wheat production can accelerate? Is the quality of locally produced wheat an important consideration? These are the kinds of questions that this paper aims to address. production in Thailand. The study will assess trends in wheat production, consumption and utilization, trade and prices, and will then analyze the current state of production technology and marketing. Private and social costs and returns for wheat production in Thailand will be estimated. These factors will be placed in the context of public policy, past and present. This study builds on earlier efforts to assess the potential for wheat production in Thailand. Titapiwatanakun et al (1982) gave an early picture of wheat production technology and marketing. Harrington and Sat-thaporn (1984) assessed the social profitability of domestic wheat production compared to alternatives. Wheat production technology and wheat input and product markets, however, have evolved considerably since these early papers. The present study uses updated field information on farmers' wheat production practices, and takes account of changes in the wheat marketing system, especially the apparent willingness of domestic flour mills to purchase locally produced wheat at attractive prices. The results of this paper should still be used with caution, however, as wheat production technology and marketing arrangements still continue to evolve. Three distinct phases can be recognized in the overall development of wheat production in Thailand. In the first phase, the Ministry of Interior' Production Support Program fostered an increase in wheat area and production, peaking in 1967. This program ceased around 1969 arid wheat area began to decline. In the second phase, a few far mers that had been involved in the MOI program (perhaps less than a dozen) continued to produce wheat commercially. These farmers had developed efficient cultivation practices and had established links with a specialist market using wheat in the production of ba sae or glucose syrup. In this market, wheat could be sold at reasonably high prices (9-11 baht per kg). These (relatively large) farmers are concentrated in Mae Sai District, Chiang Rai Province and have maintained wheat area at around 1,000 rai (160 ha) per year, at least until the mid-1980's. 1. The DOAE was not established until 1967. The MOI project was implemented by district administrators, who fall under the jurisdiction of the DOI. yields for each of the three phases. Harvested area, production and yield of wheat in Thailand Phase 1 1965-69. Phase 2 1970-86. Phase 3 after 1986.
a/ '1965" is used for the crop year "1965-66", similarly for other years. Data from 1972-77 not available. Note that: = preliminary data; na = not available; 1 ha = 6.25 rai. Source: Department of Rural Administration, Ministry of Interior (1965-71); Office of Agricultural Economics, Ministry of Agriculture and Cooperatives (1978-86); and Department of Agricultural Extension, Ministry of Agriculture and Cooperatives (1987-90). .. . ... . .. . . .. . . . .. ..Ye a r.s. . . . . .. . . . .. . . .. . . . . .. . . . . Recent changes in wheat production and area in Thailand have been dominated by the promotional activities of the DOAE-1. These activities have concentrated on two distinct production environments: rainfed and irrigated. In some rainfed upland areas, wheat may follow wet season maize. In these areas, wheat is planted in mid-October and relies on late rains and residual moisture for growth. Note that rainfed upland maize area in Northern Thailand covers about 700,000 rai (or about 112,000 ha) and that the cultivation of a second crop after maize is not common. In some lowland rice areas, wheat may follow the main rice crop. In these areas, irrigation water typically becomes increasingly scarce as the dry season progresses. Numerous crops arte currently grown after rice in the winter season, e.g., soybean, garlic, peanut, tobacco, especially where dry season water is relatively abundant and where soil texture and fertility are suitable. Wheat production in this environment is most suitable where dry season water is relatively scarce, i.e., where the efficiency with which wheat can use scarce moisture gives it a competitive edge. Note that about 300,000 rai (48,000 ha) of soybean are grown after rice in lowland areas in Northern Thailand. 1. The story of wheat promotion in Northern Thailand is an interesting one. Progress with wheat has been painful and slow compared to progress with export crops such as maize and cassava. Expansion of wheat production was not aimed to the export market; rather it aimed to replace imports. Areas suitable for wheat expansion have only recently been clearly identified. Wheat production technologies were first developed on experiment stations, but truly acceptable practices have only recently emerged from a process of farmer adaptation. Links with flour mills were weak until 1988. Note that the government has taken the lead in wheat promotion whereas the private-sector had a strong, if not leading role, in the promotion of maize and cassava. policymakers. As a consequence, targeting of wheat promotion was modified to include rainfed upland areas, and irr gated areas where other winter season crops weree not suitable". Currently, wheal production is fairly evenly split between the two production environments. Over the last several years, centers of wheat production have been developed in seven districts in six of the eight provinces located in Northern Thailand. (Fig. 1). These centers are concentrated in areas where there is either limited water available during the cool season, or where fev, alternative cropping alternatives exist. Most wheat farmers cultivate less than 5 rmi (0.8 ha) of this crop. Wheat production seems most attractive to small farmers in u favorable environments who have relative few options. 1. Maximum yields obtained under irrigate d conditions were obtained at higher elevations (500-7(X) masl) by farmers who used additional fertilizer beyond that supplied by DOAE. Maximum yields for rainfed conditions were achieved at representative upland sites, where fertilizer use was limited to that supplied by DOAE. Trends in wheat area and yield, disaggregated by production environment, are shown for the last few years in Figs. 3 and 4. More detailed information on wheat production environments is provided in Section 6. Wheat imports take the form of grain (including meslin 1), flour, and groat and meal. Three classes of wheat are imported (mostly from Australia, Canada and the USA): hard wheat, soft wheat, and durum wheat. Hard wheat has a protein content of around 12-15%, produces a white flour, has a high content of gluten and is most suitable for making bread. The protein content of soft wheat varies from 9-11%. Soft wheat also produces a white flour, but has low gluten content and is most suitable for making cakes, donuts and pastries. Durum wheat has a protein content of around 14% but has a less elastic gluten. It is most suitable for making pasta. Most imports are of hard and soft wheat grain. Very little is imported in the form of finished products, e.g., macaroni, spaghetti, wheat gluten, biscuits, etc.. (Table 2 and Fig. 5). Total imports are growing at about the same rate as consumption -- around 8.3% per year since 1975. 1. Meslin is a mixture of soft and hard wheat (classifications used by the Dept. of Customs). market for this flour and may take over Thailand's past role in this regard. It may be surprising to realize that Thailand also exports (or, more precisely, reexports) wheat products. Much of this is forwarded to neighboring countries. The major wheat product export is wheat bran and other milling byproducts, used as an ingredient in livestock feed. Wheat bran exports have been growing at a rate of around 10% per year, reaching 54,000 tons in 1990. Major markets include Malaysia, United Arab Emirates and Bahrain and, more recently, Taiwan, Brunei and Oman. market in exported frozen shrimp. Precise data on the quantity of wheat flour used as shrimp feed is lacking. It should be iioted, however, that shrimp exports have increased sharply from 34,000 tons in 1987 to 91,000 tons in 1991, with a similar increase in export value. Wheat flour is typically included in shrimp feed as a binding agent and flour utilization for this pL rpose can be expected to have increased proportionately. Much of the wheat flour used as shrimp feed, then, is reexported in the form of shrimp. Some estimates pla-:e feed uses of wheat products as high as 15% of wheat equivalent utilization. Other exports include wheat Ar meslin flour (largely to countries like Laos) and finished products such as bread, pastry, cakes, biscuits and other bakers' wares. Altogether, the export of wheat proclucts has been growing at a rate of 13.7% per year since 1975. 1990, consumption grew at an annual rate of 8.3%, almost entirely based on imports. less than I % of total wheat utilization. probably underestimatedb/ CalcuLated by InXi = a + b Year, where X is production, imports, exports or consumption. - and as an ingredient in animal feeds, especially shrimp feed. Over the last 10 years, wheat use for animal feed has grown most strongly. Most other uses of wheat have declined as a proportion of the total (Table 4 and Fig. 7). continue to increase at the explosive levels (almost 18% per year) seen in the recent past. Wheat consumption growth rates hold implications for flour mill infrastructure development as well as for the development of domestic wheat production and marketing. 1. Typically, wheat consumption also increases with urbanization. In Thailand, however, urbanization and per capita GDP are highly correlated (r = 0.927). Consequently, urbanization was not included in the model. * Preliminary estimate, may be more than shown here. All variables except for Pw ar;-, expected to vary directly with the dependent variable. That is, as the price of rice or as per capita GDP increase, per capita wheat consumption is expected to increase; as the price of wheat increases, per capita consumption of wheat is expected to decline. Thailand is explained by the equation The F value shows the significance (1%) of the equation in explaining the variation iM the dependent variable. The Durbin Watson statistic indicates that serial correlation is not a problem. All coefficient signs are as expected, and all have a significant e fect on the dependent variable. 1. Numbers in parentheses arc t-statistics. increase in the price of rice is expected to lead to a 0.34% increase in wheat consumption. Finally, a 1% increase in per capita GDP is expected to lead to a 1.25%, increase in wheat consumption. Per capita wheat consumption can be projected for the period 1990 to 2000 by using equation (2) mn combination with projected levels of the independent variables for those years. Assuming that trends from the past 15 years will continue into the future, wheat prices were projected to decline at 2.4% per year, rice prices to decline at 3.5 %X per year and GDP per capita to Increase at 3.5% per year (see Appendix Table 24). Forecasts for per capita wheat consumption and total domestic wheat consumptioin for 1990-2000 are shown in Fig. 8. Note that by the year 2000, total wheat consumption is expected to reach around 650,000 tons, with per capita consumption exceeding 9 kg per year. Wheat and flour prices in Thailand, with a few exceptions, follow international prices. Table 5 and Fig. 9 show wheat and flour prices from 1981 to 1990. Real (i.e., deflated) wheat import prices CIF Bangkok show a declining trend. Nominal CIF prices have fluctuated, but with little overall change over the time period in question. Nominal wheat prices, after accounting for import taxes, are considerably higher than nominal CIF prices, though the difference is much less now than a few years ago (Fig. 10). Additional information on import taxes is given in Section 5. Total consumption Per capita cons. b/ See Section 5 for summary of policies, especially taxes, that affect wheat prices. c/ Department of Internal Trade d/ Calculated by InXi = a + b Year, where Xi represents wheat or flour price. Real prices deflated by the consumer price index. Nominal wholesale flour prices show an increasing trend, but real wholesale prices (i.e., adjusted for inflation) are stable. Interestingly, the processing margin, or the difference between after tax wheat prices and wholesale flour prices, has been much higher in the past few years (Fig. 10). One price "series" not included in Table 5 is what might be called the "mill offer" price. Since Lhe DOAF restarted the wheat promotion program, local flour mills have been persuaded to offer premium prices for locally produced wheat. The offer is valid at the flour mill in Bangkok and is subject to quality standards. In determining the farm level price, marketing costs are subtracted from the mill offer price, so farm prices are somewhat lower and vary by location. Farm -level prices were found to be around B/5.5 to B/6.5 per kg -- similar to after tax prices for imported wheat placed in Bangkok. Information on markets were synthesized in two steps: first, information on market structure and performance was elicited from secondary data, and from experienced observers, including flour mill representatives and DOAE officials. 'This information was spot checked through interviews with farmers and small traders conducted in several Districts and Provinces of Northern Thailand during the wheat season of 1990-91. Survey work was based on methods of RRA (rapid rural appraisal). 1. The wheat should be clean from foreign materials, dust, and broken grains. Sprout-damaged wh' a, is considered particularly unacceptable. Import taxes reflect tariffs, standard profit tax, commercial tax and municipal tax. Tariffs were reduced in 1989. Marketing of locally produced wheat in Thailand is still poorly developed, due to the very small volume of wheat production. During the early phase of the DOAE promotion program, farmers were encouraged to produce small volumes of wheat for home consumption. This approach, however, had only limited success. At this time, almost all domestically grown wheat is sold by farmers to middlemen, who in turn either sell it to up-country glucose syrup (ba sac) factories, to flour mills in Bangkok, or to DOAE seed multiplication centers for use as seed in the following wheat crop (Fig. 12). Farmers selling wheat directly to glucose factories are primarily from Mae Sai District of Chiang Rai Province. These farmers, who began wheat cultivation under the MOI Production Support Project, have greater experience in wheat production and have forged a close relationship with glucose syrup factory owners. As wheat production has expanded, the price paid by these factories had declined to B! 7 or B/8 per kg. 1. Only large flows, accounting for at least 1% of wheat utilization, are shown in Figure 11.
yeas -r- sedo rc (ab prc~~at- t(13%'g )"
Development of market linkages between farmers, traders and Bangkok flour mills has been fostered by the establishment of "local wheat buying centers". As part of its effort at crop promotion, the DOAE negotiated with flour mills to set a guaranteed price or "mill offer price" (see Section 3.4) and to designate local traders as buying centers for the crop. As the volume of wheat production has increased, the number of buying centers has grown from two (1988/89) to eight (1990/91) (Table 6). Chiang Mai Fani Thai Flour Miltt Co. Ltd.
Cha- Pakarn Thai Flour Mill Co. Ltd. Chiang Rai Muang Siam Flour Trading Co. Ltd.
Phayao Muarig Siam Flour Trading Co. Ltd.
Lampang Muarng Siam Flour Trading Co. Ltd.
Ngac Siam Flour Trading Co. Ltd.
Phrae Denchai Siam Flour Trading Co. Ltd.
Nan Pua Laem Thong Sahakarn Co. Ltd.
Mae Hong Son Pai United Flour Mittll Co. Ltd.
suggestion. Generally, however, divergence from this suggested price has been small. Local traders complain that they must purchase very small lots of wheat over extended periods of time (several weeks), adding to their costs. While local traders have cooperated with the program initially, it must be remembered that they are free agents and are unlikely to continue serving as wheat buying centers unless their margins cover all costs, including normal profits. Wheat quality has little effect on price now, but may have a larger effect in the future. To date, mills have not insisted on the maintenance of strict quality standards (other than to reject lots with sprout damage). Protein content has no effect on price at present; mills have agreed not to impose discounts based on protein content while domestic production contributes less than 10% of their requirements. Given current rates of operation, then, domestic production could grow to over 30,000 tons per year before protein content becomes an issue. Mills have indicated, however, that they will gradually become more strict with regard to moisture content and foreign matter. (and continues to be) a significant market for farmers, accounting for nearly a quarter of production.. Due to stricter standards, this wheat commands higher prices, around B/ 7 to B/8 per kg. due to a low purchase price of whet. In this case, quality was poor and wheat was sold before the year's mill offer price was set (Table 7). In general, marketing costs for wheat appear similar to market ng costs for soybean, a major grain legume grown in Northern Thailand in or near some wheat production areas (Table 8). At present there are four modern flour mills, all located in the Bangkok area. One new mill is under construction and is expected to commence operations in early 1992. Milling capacity is growing rapidly (from expansion of existing mills as well as the construction of a new mill) and vill exceed 800,000 tons of wheat per year by 1992. This capacity appears adequate to meet expected increases in demand over the next several years (Fig. 13). Thailand is remarkable in thc freedom with which the economy is allowed to operate. For many commodities, frce trade is the rule and market distortions are kept to a minimum. Exchange rates are kept at realistic levels. As a consequence, the economy has performed remarkable well, with annual GDP growth rates for the last several years above 10%. (Brooks, 1989). There are, however, several distorting policies impinging on the wheat subector. Traders' marketing margins for wheat grain farm to Bangkok flour mill. make imported wheat and flour more expensive than they would otherwise be, and make domestic wheat production rr ore attractive is warranted in pure efficiency terms. At present, the tariff on whe it grain imports is B/ 1.00 per kg. The standard profit tax (SPT) for wheat grain imports is 10.5% of the CIF price, while the commercial tax is 1.5% of the CIF price after the SPT has been added. Finally, the municipal tax is currently equivalent to 10% o the commercial tax. Tariff rates have changed over time, declining from a high of B/ 2.75 per kg in 1985-87 to B/ 1.00 per kg currently. Some attribute this decline in wheat import tariff to requests made by major wheat exporting nations. Tariffs on imported flour remain high and are said to encourage flour smuggling, especially in Southern Thailarid. SPT and commercial and municipal taxes are somewhat different for wheat grain vs. flour (Table 9). The total amount of tax paid per kg of imported wheat is illustrated for the years 1981-1990 in Fig. 10. The effect of these taxes on the after tax price of wheat grain is shown in Fig. 9. An example of the calculation of wheat price after taking account of these taxes is shown in T ible 10.
a/ Tariffs for flour include surcharges of 30% to 40% imposed in different years. locally produced wheat1 of B/ 7.3 per kg is well above the "after-tax" price in Bangkok for imported wheat of about B/ 6.2 per kg2. Moreover, imported wheat has charac1. The "mill offer" price is valid at the locatic n of the flour mill. Consequently, farm-level prices are somewhat less. 2. Initially, the mill offer price was roughly equivalent to the after-tax Bangkok price of imported wheat. Since then, however, world wheat prices have declined. teristics which should command a price premium -- e.g., higher flour recovery rate as well as greater uniformity. The existence of a relatively attractive 'mill offer" price can be attributed to an agreement between the Department of Agricultural Extension and individual flour mills, forged in response to criticisms about lack of markets for locally produced wheat. In an effort to foster domestic wheat production in Northern Thailand, the Department of Agricultural Extension has offered prospective wheat farme- rs free inputs, particularly wheat seed, fertilizer and threshing services. Given the inconsequential level of local production, this can hardly be classed as a major distortion in the wheat economy. In the event that domestic production takes off, it seems likely that these subsidies will be phased out. wheat enterprise as subsidies are gradually phased out. This question is addressed in the next section. 1. One option that is rarely discussed is the use of domestically produced wheat as flour for use in the manufacture of shrimp feed, the fastest growing component of wheat utilization in Thailand. The need for uniform flour quality would seem to somewhat less compelling here. Cost and return estimates arc modified in two steps, as the effects of subsidies and taxes are eliminated. In the firs I step, the effects of direct subsidies from the DOAE promotion program are removed. In the second step, social costs and returns are estimated by using opportunity costs for the values of inputs, domestic factors and outputs. The objective of these corn parisons is to ascertain which production systems (if any) offers the best chance for economically efficient domestic wheat production, given alternative uses for farmers' rt:sources. There is immense variation in farmers' wheat production practices. Some wheat is grown in rainfed upland arc as, and some is grown after rice in irrigated paddy areas. In rainfed areas, the technology used by farmers appears associated with farm size, wheat area, and farmers' resources (e.g., availability of large tractors). In both areas, production practices .re still changing and evolving, largely through farmer experimentation. 1. These estimates were synthesized in two steps: first, information on practices and their corresponding costs were elicited from experienced ob ,ervers, including wheat scientists and extension workers active in the DOAE wheat promotion proj ct. These were then spot checked and adjusted through a series of farm interviews in several Districts and Provinces in Northern Thailand. Quantitative data on costs and returns are for the wheat season 1990-91. Wheat in this system is grown in a maize-wheat, groundnut-wheat or soybeanwheat pattern. Non-wheat farmers typically grow only a single rainfed crop. Land preparation is carried out by power tillers, or in some cases manual hoeing. Furrows are opened with a hoe, and seed and fertilizer are dropped into the furrows and covered with the foot. This method of seeding in rows permits more control over seed placement1 and allows hand weeding between the rows (though it appears that this is rarely practiced). This method is labor-intensive and slow, and farmers can typically plant only a small area during periods of optimum soil moisture condition. Farmers using this system tend to have smaller sized farms, and largely depend on family labor for wheat cultivation. However, it appears that many farmers using this system in the past have dropped it in favor of alternatives. 1. Good seed depth (3-5 cm) helps germination by placing the seed in areas with better moisture and lower temperatures. in Fang District, Chiang Mai Province, but may be found in most rained wheat production areas. When grown, wheat is typically grown in a soybean-wheat pattern. Tillage is performed with a lirge tractor, then seed and fertilizer are broadcast and covered by tractor harrowing. Hired labor is used for all production practices. Farmers using this system tend to h:ive relatively large farmers and are concentrated in Mae Sai District of Chiang Rai Province, and have a relatively long tradition of cultivating wheat. Following rice harvest, the la nd is prepared with small power tillers, then raised seed beds (1-2 m. wide) are formed, with irrigation channels between them. Furrows are opened along the beds with a hoe, and seed and fertilizer are dropped into the furrows and covered. Irrigation is by seepage into the beds from the channels. This system is the one that has been officially recommended for irrigated areas, but appears to be diminishing in importance. At present, it is found in Pua District, Nan Province. A number of problems have been found with this set of practices. First, the presence of irrigation char nels encourages over-irrigation. Some farmers allow the soil to become waterlogged before draining the field. Second, the use of line sowing lends itself to overseeding, with consequent problems of interplant competition and poor tillering. Finally, raised beds and dedicated irrigation channels are not only costly to construct they' also take up valuable space in the field and effectively reduce planted area by 2(!-30%. rice-garlic-soybean pattern. Following rice harvest, the field is cleared of straw. Then, furrows are cut and drainage channels dug around the perimeter and across the field to facilitate distribution of irrigation water. Seed and fertilizer are dropped into the furrows and covered. Irrigation is carried out by "flash flooding" and then immediately draining the field. This system eliminates the need for land preparation and, as a consequence, substantially reduces machinery costs. In addition, it may speed seeding (important, because late seeding is a major cause of reduced yields). Most important, less surface area is lost to water control structures compared to the "officially recommended technology" (Ir/Row). Still, the digging of furrows and drainage ditches requires very substantial amounts of labor. This system, which may be most suitable for small farmers without access to power tillers, was developed by farmers in Pai District, Mae Hong Son Province. described above (Ir/DD). Following rice harvest, the soil is prepared with a power tiller. Then, seed and fertilizer are broadcast onto the surface of the soil and covered by harrow or rotovater.1 This system is allows rapid sowing and requires little hand labor: one farmer can prepare and seed 4 rai (about 2/3 ha) in one day. If wheat seeding is done after rice harvest but before rice threshing, there is little delay in wheat planting. However, to use this system a farmer must either own or rent a tractor2, and a higher seed rate must be used to compensate for the variable seed depth resulting from broadcasting. In addition, fertilizer efficiency may be lower than alter.1. A common management error made by rice farmers that are not accustomed to wheat cultivation is in not covering the seed. Note that when rice nurseries arc broadcast sown, the seed is not covered. 2. At present, no tractors are owned by farmers in the village where wheat is being grown. Rented tractors are brought in from towns in a neighboring Province, which adds considerably to the expense. The profitability of this technology is quite sensitive to tractor rental costs and, therefore, to the likelihood that local farmers will eventually purchase their own tractors. native systems where seed and fertilizer are placed together in a furrow. This system, like the previous one, may be seen in Pai District, Mae Hong Son Province. Enterprise budgets presentec in this section were synthesized from a variety of sources: expert opinion of wheat scie ntists and extension workers associated with the DOAE wheat promotion program; official DOAE recommendations for wheat production; and a field survey of wheat farmers conducted in March, 1991. This field survey followed techniques of rapid iural appraisal and was used to spot check and adjust estimates derived from the other sources. systems described in the previous section. The first budget (private budget) uses costs and returns as observed from the far ners' viewpoint. The second budget (private full cost budget) is a modification of the first one that includes the costs of inputs provid1. 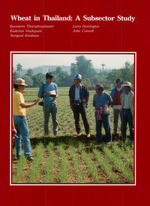 For further information on wheat research issues in Thailand, see Saunders and Mann (1991). ed free by the DOAE, including seed, fertilizer and threshing services. The third budget (social budget) values all inputs and outputs, including tradeable inputs and products and domestic resources, at their opportunity costs. Sensitivity analysis is performed on the private full cost budgets and the social budgets. A review of wheat price estimates might be useful before proceeding with the analysis. In the following sections, wheat prices from 1990 are used. These are similar to a five year average ot prices for the preceding years (1985-90). If the declining trend for wheat prices continues into the future, the use of 1990 prices (or 1985-90 average prices, for that matter) may overestimate the profitability of future wheat production. 1 A summary of 1990 wheat prices is provided in Table 11. Initially, budgets are intended to represent costs and benefits associated with the use of recommended levels of Inputs when common management errors (i.e., overseeding or overwatering) are avoided. Yield estimates are based on the notion of "expected yields? -- that is, yields farmers would likely obtain when using practices as described above. Note that these are somewhat above average yields as observed in the field, but considerably below the yields obtained by the best farmers under good conditions (Fig. 14). There is reason to believe that it is more sensible to use expected yields, not current yields, when assessing the longer-run prospects for wheat production and profitability in Thailand. This is discussed more fully in section 6.3. 1. Sensitivity analysis is used to examine the effect on profits of varying yield levels. 1. Data presented earlier suggest that world wheat prices as measured by real CIF Bangkok wheat grain prices have declined at the rate of 2.4% per year over the years 1975-90. World wheat prices have been gradually declining, in fact, for well over 100 years (Reinsel 1991), although price spikes can occasionally be observed. CIMMYT (1991) notes that world wheat prices collapsed in 1990-91 with a sharp rise in developed country production and an increase in world wheat stocks. Prices were further depressed by export subsidies by the US and the EC (which, however, may not be sustainable). Over the longer term, real wheat prices will probably continue to decline, although some uncertainty exists with regard to the current GATT negotiations, prospects for area and productivity change in the exSoviet Union, and the possibility of US and EC policy changes. a/ In 1990, US$1 = B/26. b/ Source: Table 5. c/ Source: Table 7. d/ Calculated by subtractling the marketing margin from the CIF Bangkok grain price. Maximum yields: average from 1988-90. Mean yields: average from 1987-90. Source: Fig. 4. Expected yields defined as yields knowledgable farmers can obtain when simple management mistakes are avoided. Budgets in this and following; sections are constructed to take account of differences in production environments and techniques, as described in section 6.1. There are relatively few difference,; among budgets in fertilizer use, but large differences in labor input and machinery use. One production technique in particular, direct drilling in irrigated areas (Ir/IDD), uses immense amounts of labor at crop establishment (Fig. 15). The private budgets are int nded to represent costs and benefits from the farmers' viewpoint, with all subsidies and price distortions in place. Thus, fertilizer and seed input levels are noted but given a zero cost, as these are typically provided for free by the DOAE. Costs include labor, materials, interest on operational capital, and machinery-related expenses fo i- machinery owners (depreciation, interest, repairs, fuel, etc.). Land is assumed to have a zero opportunity cost, which may be reasonable for upland rainfed area; and irrigated areas where no winter crops are grown. This assumption of zero land opportunity cost is relaxed in later budgets. Benefits are earned from sales of wheat grain produced at the expected yield level, valued at prices paid by traders in local markets. Using 1990 data, the price of wheat in producing areas was estirrated to be about B/6.2 per kg, or around US $160 per ton. Detailed private budgets arc shown in Appendix Tables 1-6. Estimates of returns to land and management, and rates of return to land and management, are shown in Fig. 16 and Fig. 17. It shoLild be noted that, under the assumptions used, all wheat production techniques are p. ofitable. Returns to land and management appear somewhat higher, however, for the rainfed broadcast technique (Rd/Bc) and the irrigated broadcast technique (ir/Bc). In the event that wheat cultivation expands, it seems unlikely that the DOAE will be able to continue providing fiee fertilizer and seed. In the private full cost budgets, farmers are charged for these inputs at market prices. Other assumptions remain the same as in the private b idgets. Detailed private full cost budgets may be seen in Appendix Tables 7-12. Summaries of returns to land and management and rates of return to land and management are shown in Fig. 16 and Fig. 17. Note that the profitability of wheat production is greatly reduced when farmers have to pay for their own seed and fertilizer. The two production techniques based on broadcast sowing (Rd/Bc and Ir/Bc) continue Io be relatively attractive in terms of returns to land and management. yields", i.e., yields that farmers are expected to experience when using recommended levels of inputs, while avoiding management errors. It is of some interest to assess the effect on profits if farmers are not able to achieve these expected yields. In order to do this, breakeven yields were calculated. A breakeven yield is the yield level that must be achieved in order to cover IIl costs of production, including interest on operating capital and opportunity costs cf family labor1. If a farmer produces wheat at precisely the breakeven yield, returr s to land and management are zero, but nonnegative. Breakeven yields (calculated from the private full cost budgets) are shown in Fig. 18, where they are compared with expected yields and average yields (19871. Opportunity cost of land is still assumed to be zero, that is, wheat is assumed to be grown on land where it is not possible to cultivate other cr.:ps. 1600 -1 0 ". . . . . . .. .. .. .. ....... ........... ..... .... .......... ........ ... ........... .......... .. .. .... .... .. .. .. .. .. ...... ..... .. .. .. .. .... .. .. .. ..... .. .. ............... .. .. .. .. .. .
...... . . .. . . .. . . . . ............... .. .. ..... .... .. .. .. .
.. .. .. .. .. .. ................................ . .
1990). The results are of some interest. For all production techniques for both production environments, breakeve:i yields are above current average yields, but below expected yields. At current yield levels, farmers would lose money if it were not for the DOAE subsidies. This question of "current" vs. "expected" yields is important, then, and is discussed more fully in section 6.3.1. In the analysis conducted so far, it is assumed that wheat will not compete with soybean. Wheat cultivation will be t asier, however, and wheat yields will tend to be higher and more reliable in well-favored irrigated areas that are (or could be) used for soybean. In this case, the opportunity cost of land used for wheat production is no longer zero: rather, it is estimated by the returns that could be earned by producing soybean. Similarly, the opportunity ost of land used for soybean is no longer zero: it can be estimated by the returns that could be earned by producing wheat. 1 0 0 -'.............. ............. ... .......... .............. ........ ..................... .... .. ... .
One final source of distortion must be removed to assess the social profitability of wheat production. As noted in section 5.1, wheat grain imports are subject to taxation, including an import tariff, standard profit tax, commercial tax and municipal tax. For 1990, after-tax wheat grain price was estimated to be about 34% higher than the CCIF price (Table 10). These taxes represent transfers from consumers to government and producers: consumers pay more for wheat products, domestic producers receive higher prices for wheat grain, and government revenue is increased. Typically, however, these distortions create a dead-weight loss, or efficiency loss, to the .-conomy. For locally produced wheat to efficiently compete with imported wheat, it should be profitable for farmers to produce it even after price distortions (of the kind described above) are removed. That is, in order to save one dollar of foreign exchange through local wheat production, the value of local resources (land, labor and capital) used should be worth less than one dollar. ---------------------1. This inference should be used with caution, however. Soybean production in Thailand is also protected through quotas and subsidies. A complete comparison of the economics oi wheat vs. soybean would require estimates of the domestic resource cost for both commodities for common production areas, a task that goes beyond the scope of this paper. Nonetheless, the conclusion drawn here -that wheat research and promotion should focus on areas where irrigation infrastructure is not welldeveloped -- is not controversial. 2. The term "social budget" is vulnerable to misinterpretation. For example, some observers might interpret this phrase as having to do with social costs associated with rapid urbanii2tion, especially when this is fostered by lack of employment opportunities in rural areas. These social costs are not included in the present analysis, which is only intended to assess the relative efficiency of enterprises when the effects of distorting policies (e.g., subsidies and taxes) are removed. The 1990 after-tax price of wheat in Bangkok was about B/6.2 per kg ($160/t), and has been declining at over 2% Fer year. The 1990 CIF price of imported wheat in Bangkok, however, was only B/4.6 pi.r ($120/t) (Table 11). Given a marketing margin of B/1.09 from up-country producing; locations to Bangkok flour mills, domestically produced wheat would have to be priced at B/3.51 per kg in order to compete with foreign wheat, if there were no taxes on wheat imports. This assumes that domestic wheat and imported wheat are of comparable quality, or that flour mills are willing to ignore, at least temporarily, some qt ality considerations. Social budgets, featuring a decreased wheat price, are shown in Appendix Tables 15-20. Returns to land and management (with corresponding raes of return) for wheat produced in different environments with different techniques, are summarized in Fig. 21. When wheat prices are adjusted such that domestic wheat production is valued at border price equivalents, wheat production in both irrigated and rainfed land types becomes unprofitable. Note that thi! ; is true even when opportunity costs of land are considered to be zero, i.e., it is assumed that soybean and wheat do not compete for land. Returns to land and management are negative. 1. In this paper, opportunity costs of labor a:e valued at the market wage, while opportunity costs of capital are set (in real terms) at 12% per year. Opportunity costs of land are considered to be zero (unless otherwise indicated) assuming that m heat is targeted at areas where there are no competing crops. Opportunity costs of irrigation water ire ignored. There appear to be few distortions in markets for fertilizer, so up-country market prices are used as social prices. Social prices for wheat are estimated as CIF price, less marketing margi is from upcountry producing locations to Bangkok flour mills. Social returns and rates of return calculated using border price of wheat. Source: Appendix Tables 15-20. This may be somewhat less alarming than it appears. In social budgets particularly, profits are sensitive to yields a id prices. Sensitivity analysis was conducted to examine the effects of these two fac :ors. First, breakeven yields were calculated (in this case, yields required to repay all production costs and for wheat to btccome profitable when wheat is valued at border prices). These were found to be in tlhe range of 1600-2000 kg/ha. In other words, farmers need only achieve yields of less than 2 t/ha for wheat to become socially profitable (Fig. 22). These are well abo, e current yields (and even above "expected yields"), but may be achievable if farmers and researchers continue the rapid pace of advance in wheat production technology. In addition, breakeven world prices were calculated (i.e., world prices at which wheat becomes socially profitable, a:s;suming farmers achieve "expected" yields). These breakeven prices were calcuk ted for two rates of return: 0% (all production costs repaid, but no additional profits earned) and 16% (all production costs repaid, and a 16% profit earned -- similar to that earned in soybean production). Breakeven prices were found to be in the range of $130-160/t (Fig. 23). In addition, a sense of perspective needs to be kept. The analysis described above has focused entirely on efficiency objectives. However, the Thai government undoubtedly has equity objectives as well, e.g., those focusing on rural employment, equity and income distribution. Subsidized wheat production can help increase rural employment and provide additional income for low-income, rural farm families. If these subsidies are ultimately paid b) relatively wealthy urban consumers of wheat products, policy makers may conclude that the small efficiency losses are worth paying. a ) .. . . . . .. . . .. . ...-. . . . .......... . ............. .... . .
o 1004 0 .. .. .. .. .. .. ...... ........... ...... .. .... .. .. ........... .. .. .. ................. ........ .. .. .. The analyses presented so far appear to paint a rather bleak picture tor wheat. On the surface, it appears that wheat production in Thailand is only expanding because of subsidies on inputs and taxes on wheat imports, and that domestic production is unprofitable when undistorted prices are used. However, this is not the complete picture. First, there is reason to believe that "expected" yields may be a more realistic basis for long-term economic analysis than the lower "current average" yields used in some of the economic analyses. Second, the costs associated with one of the most promising technologies described (Jr/Bc) may have been overstated due to a quirk in local machinery ownership patterns. Third, a new technology currently being cleveloped by farmers may be potentially far more profitable than any of the technologies described in this paper. The implications of first three of these for the profitability of wheat production in Thailand is examined in turn. 1. Yield levels required to repay all production costs, including interest on operating capital and opportunity costs of family labor. farmers gain experience. Some common mistakes are: over-irrigating wheat (causing waterlogging), and broadcasting wheat seed without covering it. Both mistakes are typical of farmers trying to grow wtieat as if it were rice. Fig. 2 provides a graphic illustration of this process. Wheat yields (using rainfed technology) averaged around 1 100 kg/ha for a number of years. However, when large numbers of inexperienced far mers began experimenting with wheat after 1985, average yields plummeted. Interes Iingly, individual farmers that began to experiment with wheat in 1985 or 1986 (and experienced low yields) are now obtaining much higher yields -- close to 1200 kg/ha. Average yields continue to be drawn down, however, by novice wheat farmers who have only just begun to experiment with this crop. When economic analysis aim s to assess the longer-term prospects for profitable wheat production, it seems sensible to focus on the circumstances of those farmers who have successfully passed through this learning process. Low current average yields, then, may be somewhat less Alarming than they would appear on the surface. social profitability when representative tillage costs are used (Table 12). tractor hire rates from other villages in Northern Thailand are considerably lower (about B/1000/ha). trict, Nan Province. In this system, wheat seed is broadcast on untilled land after the rice harvest, and is then covered wi:h a thin layer of rice straw mulch. There are no ditches or furrows to be dug, and no machinery hire for tillage. Land preparation consists of hand-slashing the rice st ibble close to the soil surface to prevent ratooning. Only a few farmers have been observed using this system; but these farmers report wheat yields of 270 440 kg/:ai (1687 2750 kg/ha), with lower yields corresponding to fields with uneven distribution of seed and fertilizer. Note that these reported yields are well above breakeven yields needed for social profitability (Table 13). It is too early to tell whether this system will be widely appropriate for use in other rainfed environments. If it is. however, it could revolutionize the economics of irrigated wheat in Thailand. Farmers using this system were consulted during survey fieldwork, and reported information on costs and returns. These are described in Appendix Table 28 (private full cost budget) and Appendix Table 29 (social budget). This zero till system compares favorably with the best alternative irrigated wheat system (Table 13). disappears -- using preliminary assumptions on yields and production costs. hire costs, as presented in Appendix Table 26.
age yields for assessing longer-term prospects, given processes of adaptation and learning among farmers. As technology improves, even "expected yields" may prove to be conservative. * Wheat does not compete with soybean for land and water resources. When these conditions are met, it appears that wheat production can be both privately and socially profitable. The objective of this paper was to examine the prospects for domestic wheat production in Thailand. Topics covc red include trends in wheat production, consumption and utilization, and trade iind prices. Wheat marketing channels were summarized, and policies affecting t ie wheat subsector (especially DOAE subsidies on inputs used in wheat production, and tariffs on on wheat imports) were described and their effects on wheat profitability assessed. Finally, the current state of wheat production technology was examined and private and social costs and returns for wheat production were estimated fo.- different production technologies in rainfed and irrigated land types. Prospects for profitable wheat production were found to be surprisingly bright, although a few well-defined conditions must be met. Under the current policy regime, domestic wheat production appears to be exceedingly attractive. If DOAE input subsidies were to be suspended, the profitability of domestic wheat would decline, but would still remain positive. When wheat is valued at world prices (not at the higher prices that prevail after import duties and other taxes are paid) domestic production becomes unprofitable for many of the currently available production techniques. However, a sense of perspective should be kept. The yields required to reach social profitability under these conditions are not, in fact, very high -- less than 2 t/ha. Moreover, farmers are developing new techniques featuring zero tillage that reduce costs and increase yields. These new techniques may transform the economics of wheat production in Thailand, making it socially profitable under most conceivable circumstances. Further work is needed to refine and assess these new techniques. Finally, it should be recognized that narrow efficiency criteria may be inadequate for analyzing this subject. Some efficiency losses associated with domestic wheat production in Thailand may be unavoidable. However, it should be kept in mind that when wheat import taxes foster increases in domestic wheat production, wheat producers (largely rural, with relatively low incomes) gain at the expense of wheat consumers (largely urban, with relatively high incomes).' These effects may help meet national income distribution and employment objectives. Policy makers may conclude that these equity gains more than compensate for any losses in economic efficiency. -------------------1. Per capita wheat consumption in Thailand is very low, and is concentrated among foreign visitors and residents, and the relatively well-off. Most consumers -- and especially low-income consumers -rely on rice as a starch staple. Brooks, D., 1989. "Reducing Suppcrt Using Aggregate Measures, Case Study: Thailand". Economic Research Service, USDA. Staff Paper AGES 69-30. July, 1989. Barley Production in Rainfed M rginal Environments of the Developing World. El Batan: CIMMYT and ICARDA. Golden Triangle Hotel, Chiang R ai, Thailand, 24-26 January, 1990. Titapiwatanakun, B. et al, 1982. "Wheat Marketing and Utilization in Thailand". c/ Working capital charges for four months for all variable costs except for interest on machinery and harvested related expenses. Annual real interest rate set at 12%. d/ Not incLuded, as the budget is designed to estimate returns to land and management. e/ Area planted appears to depend partly on labor availability during sowing time. c/ Working capital charges or four months for all variable costs except for interest oi machinery and harvested related expenses.. Annual real interest rate sot at 12%. d/ Not included, as the bud! :et is designed to estimate returns to land and management. d/ Working capital charges for four months for all variable costs except for interest on machinery and harvested related expenses. Annual real interest rate set at 12%. e/ Not included, as the budget is designed to estimate returns to land and management. g/ Area planted appears to depend partly on labor availability during sowing time. c/ Working capital charges f:)r four months for all variable costs except for interest on machinery and harvested related expenses. Annual real interest rate sel: at 12%. d/ Not included, as the budget is designed to estimate returns to land and management. e/ Yields estimated lower thin for alternative irrigated practices due to loss of planted area :rom raised beds and irrigation channels. f/ Area planted appears to depend partly on labor availability during sowing time. c/ Working capital charges f:)r four months for all variable costs except for interest on machinery and harvested related expenses. Annual real interest rate set: at 12%. d/ Not included, as the budgett is designed to estimate returns to land and management. e/ Area planted appears to dpend partly on labor availability during sowing time. a/ Hired machinery including labor. All machinery costs (interest, fuel, repairs, depreciation) paid by machinery owner. b/ Provided free by DOAE, but charged as a cost in this budget. c/ Working capital charges for six months for all variable costs except for interest on machinery and harvested related expenses. Annual real interest rate set at 12%. d/ Not included, as the budget is designed to estimate returns to land and management. a/ Hired machinery including Labor. All machinery costs (interest, fuel, repairs, depreciation) paid by machinery owner. b/ Provided free by DOAE, but charged as a cost in this budget. c/ Working capitaL charges fcr six months for all variable costs except for interest on machinery and harvested related expenses. Annual real interest rate set at 12%. d/ Not included, as the budget is designed to estimate returns to land and management. a/ Hired machinery including labor. All machinery costs (interest, fuel, repairs, depreciation) paid by machinery owner. b/ Provided free by DOAE, but charged as a cost in this budget. c/ Working capital charges for four months for all variable costs except for interest on machinery and harvested related expenses. Annual real interest rate set at 12%. d/ Not included, as the budgEt is designed to estimate returns to land and management. e/ Yields estimated lower than for alternative irrigated practices due to loss of planted area from raised beds and irrigation channels. f/ Area planted appears to depend partly on labor availability during sowing time. ----------------------------..---------------------------------------a/ Hired machinery including Labor. ALL machinery costs (interest, fuel, repairs, depreciation) paid by machinery owner. b/ Provided free by DOAE, bu: charged as a cost in this budget. c/ Working capital charges f(:r four months for all variable costs except for interest on machinery and harvested related expenses. Annual real interest rate sel at 12%. d/ Not included, as the budget is designed to estimate returns to land and management. a/ Hired machinery including labor. All machinery costs (interest, fuel, repairs, depreciation) paid by machinery owner. b/ Provided free by DOAE, but charged as a cost in this budget. c/ Working capital charges for four months for all variable costs except for interest on machinery and harvested related expenses. Annual real interest rate set at 12%. d/ Returns to land and management in soybean production, when land used in the production of that crop is given a zero opportunity cost. a/ Hired machinery including Labor. All machinery costs (interest, fuel, repairs, depreciation) paid by machinery owner. b/ Working capitaL charges fcr four months for all variable costs except for interest on machinery and harvested related expenses. Annual real interest rate set at 12%. c/ Returns to land and management in wheat production, when land used in the production of that crop is given a zero opportunity cost. fuel, repairs, depreciation) paid by machinery owner. b/ Provided free by DOAE, but charged as a cost in this budget. costs except for interest on machinery and harvested related expenses. Annual real interest rate set at 12%.